Atriplex hymenelytra requires very well drained conditions. The Desert Holly grows 2 - 3 feet tall and wide. The holly shaped leaves are great for cut flower arrangers. Atriplex hymenelytra grows in the deserts of California and neighboring states up to an elevation of 4800 feet. Atriplex hymenelytra is tolerant of salty soil. Atriplex hymenelytra is drought deciduous. The Desert Holly will tolerate garden temperatures in the low 20°'s and brief cold snaps below. Unless soil conditions are particularly well drained, the Desert Holly is likely best grown in containers or prepared rock gardens. 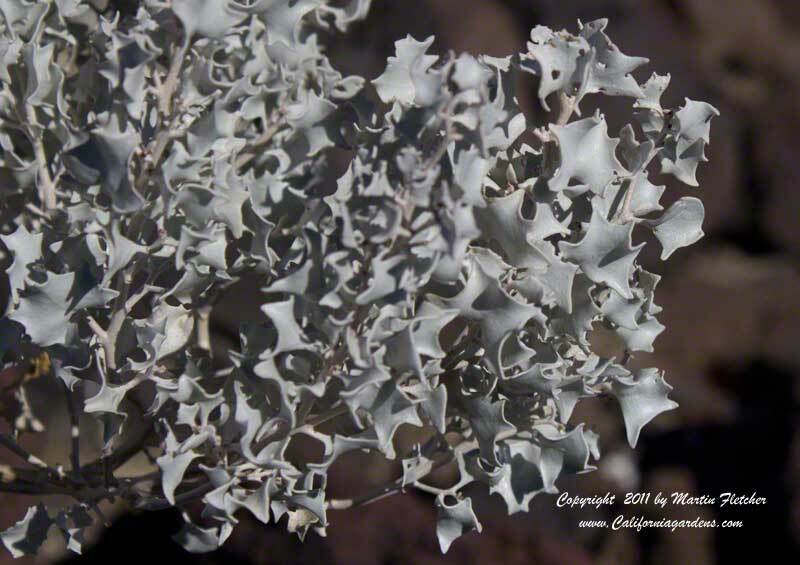 Silver foliage of Atriplex hymenelytra the Desert Holly. High resolution photos are part of our garden image collection.